Pit Bull dogs, also recognized as American Pit Bull Terriers by certain dog clubs, have historically been known as courageous and heroic animals. However, they have certainly had their share of bad press in recent decades. This can be directly attributed to the number of backyard breeders who, having recognized the Pit Bull's natural strength and courage, decided to begin breeding the most aggressive specimens they could find to develop dogs for the illegal fighting trade. Pit Bulls bred by responsible breeders are energetic and have a very sweet nature. So, the key here is to carefully check out any breeder you consider making a purchase from to ensure a dog or puppy has the proper temperament. If someone shady offers you a bargain pup, pass it by. Body - According to the United Kennel Club standard, Pit Bulls are rectangular, medium-sized dogs, and they are powerfully built with impressive heads, strong necks, broad chests and well-muscled hind quarters. 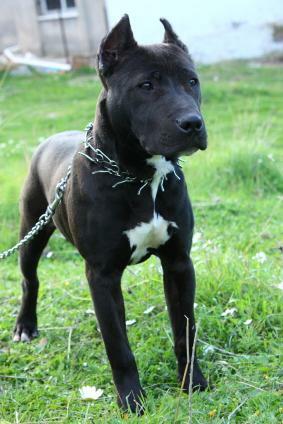 Most Pits are very strong and hardy, and they are quite agile even though they are so muscular. Everything about these dogs implies strength and confidence. Legs and feet - The legs are strong-boned, but this feature should not be overly exaggerated and take away from the dog's overall balanced appearance. The feet are substantial and in proportion with the legs. Toes should be well-arched and never flat or splayed. This gives an overall tight appearce to each foot that indicates its strength. Weight - The average adult male weighs 35 to 60 pounds, while females typically weigh 30 to 50 pounds. It's very important that an individual dog's height is in proportion with its weight. Colors - All colors and patterns are deemed acceptable except for merle. Breeders object to merle because, according to Scot E. Dowd, Ph.D. at APBTConformation.com, the pattern is a recent introduction to the breed, and it's suspected that Pits were crossed with another breed in order to bring in the gene for merles. Heads - The heads of these dogs are their most distinctive feature. They are broad, fairly flat and medium length with small to medium size ears which are cropped in some regions and left to hang naturally in others. All eye colors are acceptable except for blue. The muzzle has a well-defined stop that is not overly-exaggerated. The jaws are very muscular, and this gives these dogs one of the strongest bites in the animal kingdom. The teeth meet in a scissors bite, which means the front upper teeth close over the bottom teeth with very little space in between. Pit Bulls also display a distinctive facial expression when they are excited; they raise their ears up and inward which creates wrinkles on their foreheads. Tails - Their tails are straight with an upward bend, but never corkscrewed. They are wider at the base and taper at the tip. The Pit's gait should be powerful and look effortless. The dog should display a confident and alert attitude. The feet on both the front and rear legs should point straight forward. 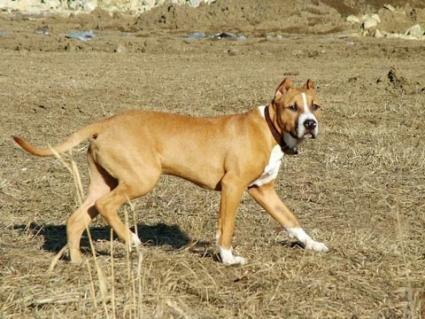 The front legs should move parallel to one another when the dog walks, as should the rear legs. When moving faster, the legs tend to converge toward a center line. It's worth noting that as of March 31, 2011, The American Temperament Test Society, Inc. had tested a total of 804 American Pit Bull Terriers. Of that number, 695 dogs passed the test, and 109 dogs failed. Mathematically, this means 86.4 percent of the total number of dogs tested actually passed the test. Visit the ATTS.org site to see the most current temperament testing statistics on Pit Bulls and a variety of other breeds. Since Pits are highly intelligent, eager to please, physically strong and tenacious animals, they make great service dogs. Pit Bull Terriers are often used in search and rescue operations and by law enforcement for bomb and drug detection. Pits also love to participate in sports. While cruel and dangerous sports such as dog fighting have been banned in most countries, weight-pull competitions have developed which give these dogs a chance to show off their strength and have some fun. The Pit's coat is smooth and quite glossy, but it is also rather stiff to the touch as befits this dog's Terrier heritage. Due to these characteristics, there is very little grooming required. A bath once every month or two should suffice unless your dog likes to play in the mud. Brush him at least once a week to remove loose fur and check for parasites. Train your dog to accept having his teeth brushed when he's a puppy so you can brush his teeth a minimum of twice weekly. Clean his ears once a week with a veterinary-approved ear wash and cotton swabs. Clip his nails once every one to two weeks or as needed. These dogs have energy to spare, but they are not hyper. They need plenty of exercise and mental stimulation, so it's a good idea to take them on walks everyday for a good 20 minutes at the minimum. Road working these dogs is another good way to make sure they get enough exercise. You can ride a bike as your dog runs along side of you; just be sure to keep him leashed. A rousing game of fetch or Frisbee will also help your dog burn off energy, and the interaction also allows your pet to put his brain into action. This kind of mental stimulation relieves stress as well as boredom, and it will likely prevent your dog from engaging in destructive behaviors around your home. Puppies are eligible to attend socialization classes, also known as "puppy kindergarten," from the age of eight weeks old. They should then be enrolled in basic obedience training by the time they are six months old to build upon their socialization and the manners they learned in those earlier classes. Once a Pit has these two basic trainings, the sky is the limit. Feel free to move on to advanced obedience classes, utility dog training, search and rescue training, therapy dog training or training for any of the sports mentioned above. Your dog will thrive under all the attention, activity and positive reinforcement he'll receive, and he'll become a better pet than you ever imagined. 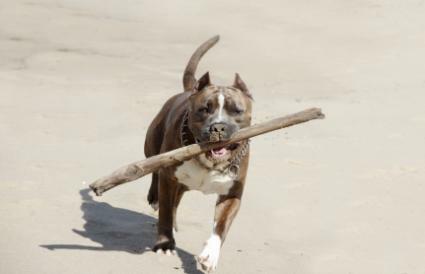 Nearly all breeds face particular health issues, and Pits are no exception. Still, these dogs are quite hardy overall. Here are some of the conditions that have been noted in the breed. Congenital heart disease - Defects in the heart muscle lead to deterioration and eventual failure of the organ. Cataracts - Opaque or cloudy areas form on a dog's eye when there is a breakdown of the fibers in the lens. Dysplasia - This is a degenerative disease of the hip joint that can also affect the elbows. Allergies - Pits are primarily affected by grass allergy and a food allergy to corn. The consensus seems to be that these dogs live an average of 12 years when they are cared for well and receive regular veterinary care, good shelter and high quality food. Some of the hardiest specimens even live a few years longer. Pit Bulls were first developed in the United Kingdom where breeders routinely crossed Bulldogs and Terriers with the goal of creating dogs that had the Terrier's feisty attitude with the Bulldog's strength. These dogs were used in the dubious sports of bull baiting and rat baiting. In fact, ratting actually gave these dogs their name since the activity involved placing the dogs in a pit filled with rats to see which dog could kill the most rats by the end of the competition. Of course, spectators gambled on the outcome, and these competitions eventually evolved into straight up dog fights. The Pit was brought to the United States by immigrants, and it was in this country that the dogs were bred for increased strength and tenacity. Consequently, this made them even more adept at fighting. However, these dogs were also trained to work at a variety of tasks. They were used to drive cattle and hunt wild hogs. The breed was also pressed into service during both World Wars as a messenger dog for the Allied Forces because of its "never say die" attitude and ability to get the job done. Images of Pits were even used on posters that promoted the war effort and the dogs became heroic celebrities for a time. A "Type" or a Breed? As mentioned, the American Pit Bull Terrier is recognized as an official dog breed in some parts of the world. In others, it is just considered a "Pitbull type" of dog that displays some consistent characteristics rather than a full-fledged breed. The American Kennel Club (AKC), for example, does not currently recognize these dogs as American Pit Bull Terriers. However, they do recognize the very similar American Staffordshire Terrier, and many people consider both breeds to be one and the same. This is because the original dogs registered with AKC were really American Pit Bull Terriers. The AKC actually closed open registration for Staffordshire Terriers at one point and only registered dogs sired by parents that already held AKC registration. The studbooks were opened again for a brief period in the 1970s which allowed more Pit Bull Terriers to be registered as Staffordshires. 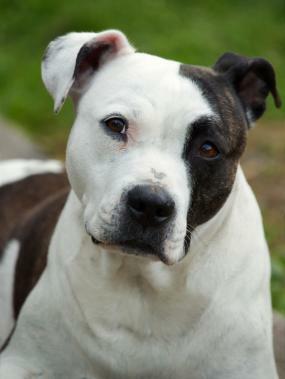 The studbook was then closed again, and Staffies were renamed American Staffordshire Terriers in 1973. The American Dog Breeders Association Inc. It's interesting to note that the United Kennel Club and the American Dog Breeders Association both allow American Staffordshire Terriers to be registered with their organizations as American Pit Bull Terriers. Today, the once beloved Pit Bull is a misunderstood breed. Villainized in the media and threatened by breed specific legislation, Pits may one day be a lost breed. The media is quick to credit any dog bite to these dogs. Breed specific legislation affecting Pit Bull dogs ranges from all-out bans to laws that require Pit Bull owners to carry costly insurance policies. The American Bar Association maintains a listing of state legislation regarding these dogs. Far too many of these dogs wind up in shelters and many are automatically euthanized due to local laws or uncertain temperaments that make individual dogs unsuitable for adoption. If you think you can make a positive difference in a dog's life, consider contacting one of the following Pit Bull rescue shelters. They may even be able to direct you toward a shelter in your area. The following books offer good reference material on Pits. Pit Bulls For Dummies by D. Caroline Coile, Ph.D.
Is a Pit Bull the Right Dog for You? Due to the Pit Bull's great strength and fearless nature, it's important to spend sufficient time socializing and training young dogs. The ideal owner is very responsible and dedicated to making sure this dog receives training. Rest assured that if you don't establish yourself as your dog's pack leader, your dog will wind up being your leader, and that's usually where most behavior problems begin. If you have a rather laid-back personality, this is probably not the breed for you. If you do feel you have the energy and desire to provide the kind of active ownership this dog needs, take time to visit breeders and Pit rescues in order to assess their dogs' health and attitudes. Make sure the dogs are outgoing and friendly. Dogs that shy away from you or behave aggressively have not been raised around a lot of people and socialized as needed. Remember, a well-bred Pit is a confident, friendly character, and he's not afraid to check you out in hope of making a new friend. Puppies should be naturally curious and affectionate. If you can locate a Pit that displays these characteristics, and there are plenty of them being raised by responsible breeders, you'll have found a canine companion that will bring you great joy and satisfaction.